90A Mastervolt alternator & three stage regulator. 4 x Trojan 120Ah Deep Cycle Batteries. Baby Stay on Fico recirculating ball car & track. Balsa / GRP sandwich hull construction, lead keel with centerboard inside. Deck is Balsa / GRP with Plywood reinforcing. 2 x Fridges one 12v eutectic and one engine driven compressor. This Northshore 46 designed by Hank Kauffman and built by Northshore Yachs Sydney, has been well maintained by her very knowledgeable owner who has sailed her mostly single handed for the last 8 years. A safe and comfortable cruising boat and a capable offshore racer, with her lead keel and centerboard, she can also get into those shallower and more sheltered anchorages. Comfortably sleeping 5 in two doubles and a single cabin, the saloon settee converts quickly into two more singles. 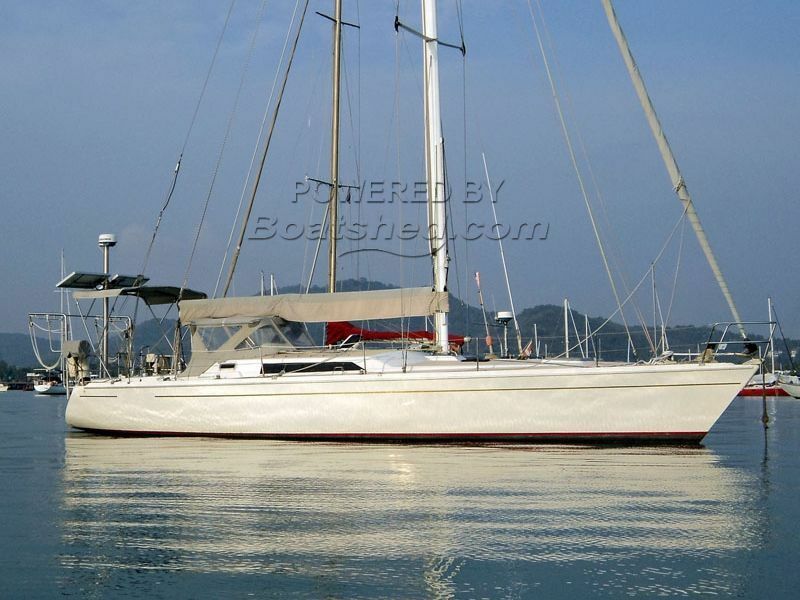 For more information on this Northshore 46 and other great boats for sale in Phuket, Koh Samui Thailand & Langkawi, please contact the Boatshedphuket.com Asia yacht sales team. This Northshore (Australia) 46 Centerboard Sloop has been personally photographed and viewed by Alan of Boatshed Phuket. Click here for contact details.